This listing is for a SPECIALIZED FLORAL DESIGN. 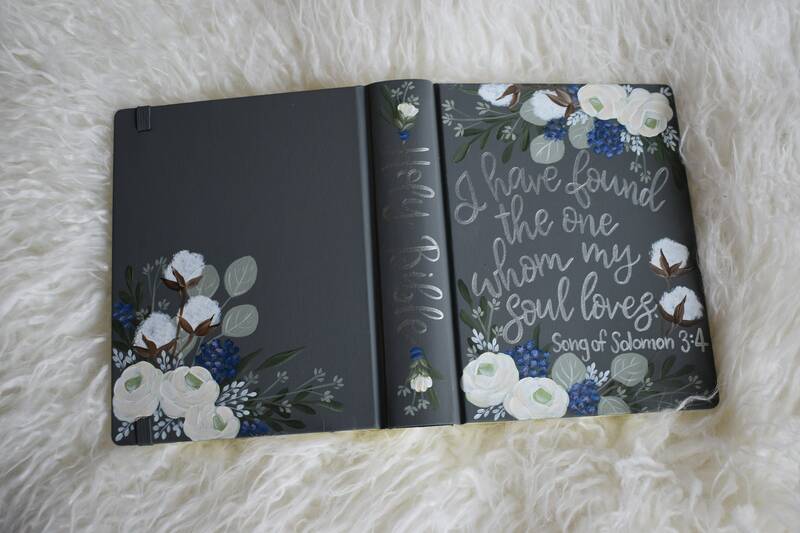 These bible designs have a special assorted mix of florals and are the most detailed bible designs I offer. Send me a photo of your wedding bouquet inspiration, baby nursery room fabrics/wallpaper etc and I will custom match them in my whimsical floral style. 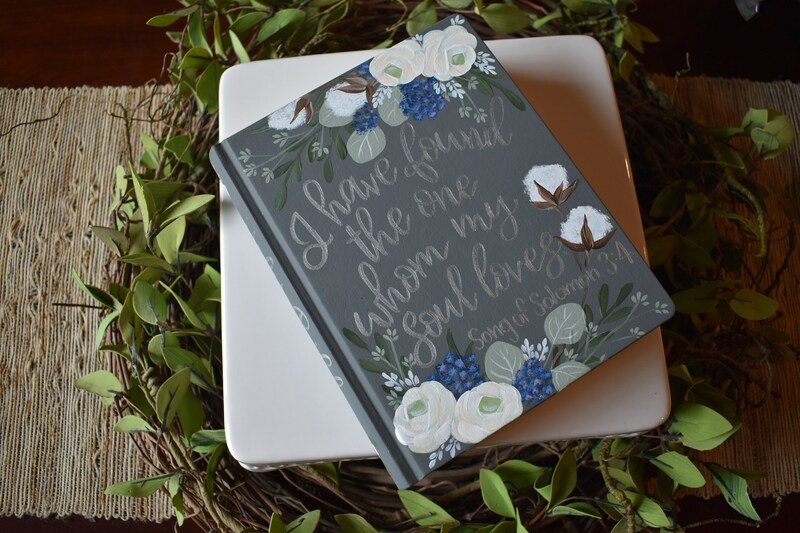 This listing can be purchased as shown in the photos, or the design can be the same with a different color palette, or can be totally custom to match the floral photo inspiration that you send me. 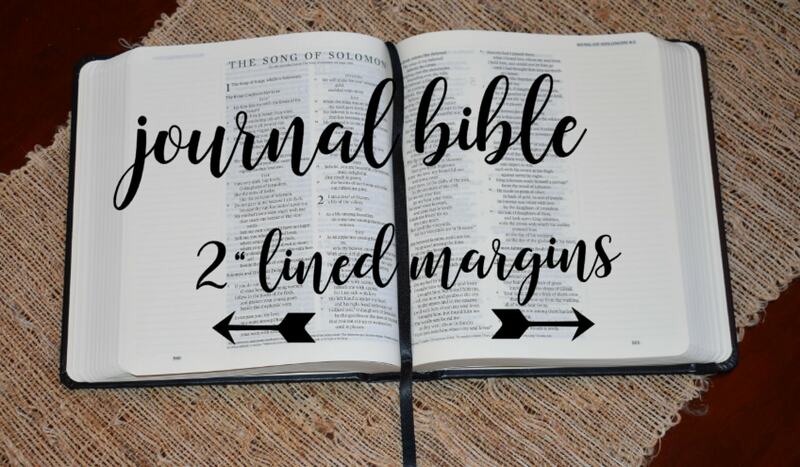 **PLEASE NOTE IF YOU REQUEST A WHITE, IVORY OR SOFT COLORED BASE DESIGN THE ONLY BIBLE AVAILABLE FOR THESE DESIGNS IS THE ESV JOURNALING BIBLE. 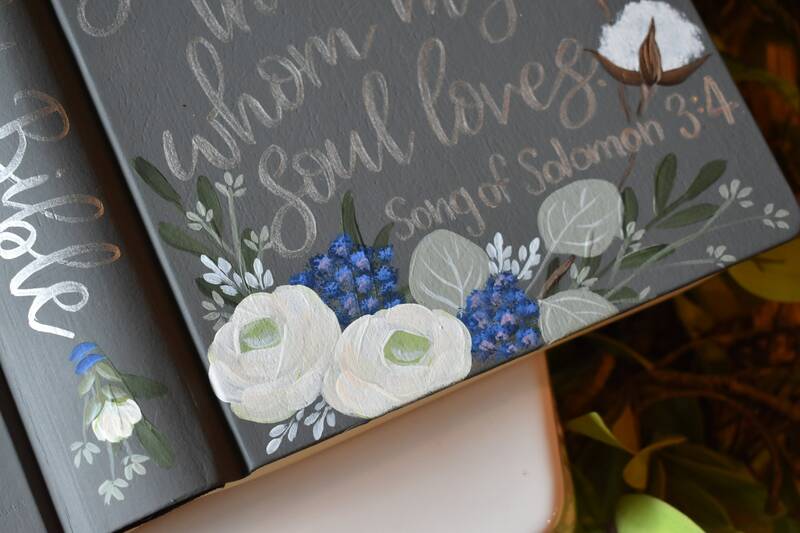 **Bible example shown in this listing is has a blend of white roses with cotton stems and seeded eucalyptus greens. 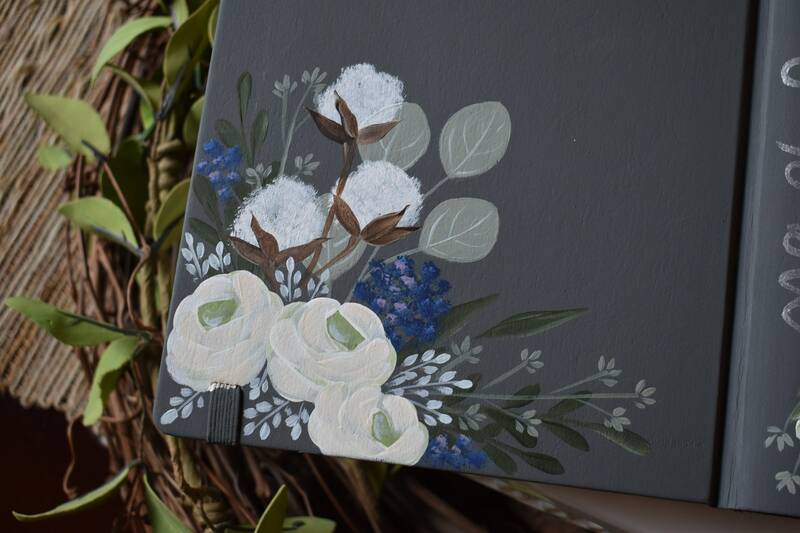 Base color storm gray with floral color palette in shades of white, soft green, navy, and soft heather lavender. Foliage added in dark pine green and silver sage green. Lettering shown is metallic silver. 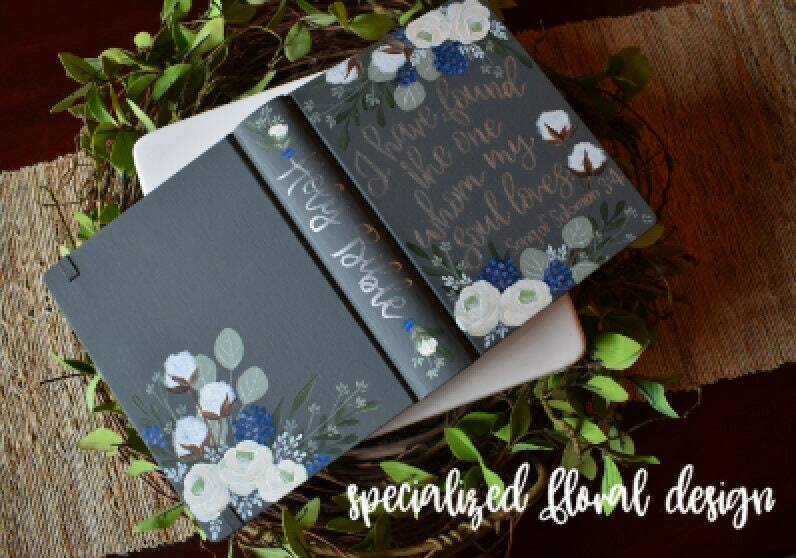 ** 1 SIDE OPTION-Price includes: Floral design as shown on front, spine and back. 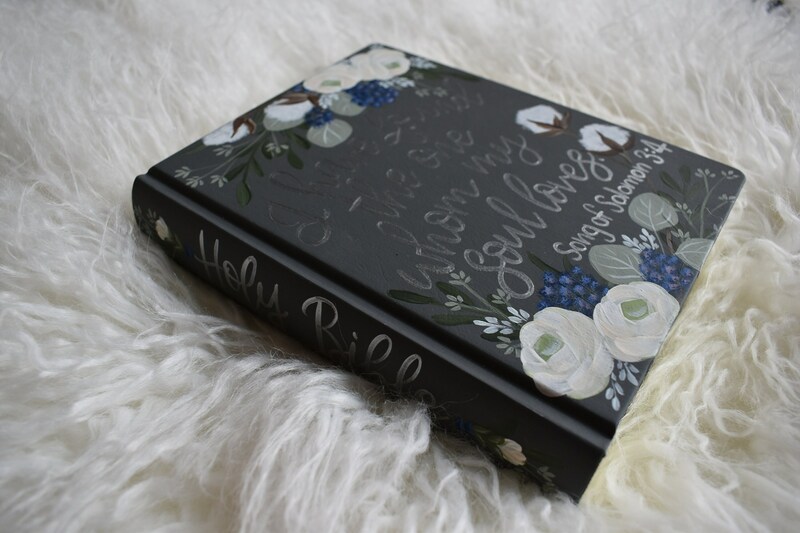 Lettering on the front and spine. Up to 14 words works best. Longer verses will need to be a mix of script and block style lettering to fit the text within the design.